Some are rounded, some are pointy, others are, well, even more pointy. But looks are only one aspect of a great metal guitar. You also need a comfortable, fast neck and killer pickups. Maybe you even want an extra string or two for added growl and bite to riffs and solos, or a Floyd Rose for some extreme dive bombs and horse whinny action. 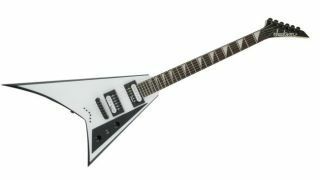 At first glance, the Epiphone Limited Edition Richie Faulkner Flying V Custom Outfit is a handsome combination of a traditional Flying V guitar with Les Paul Custom appointments like an ebony fingerboard with block inlays, multi-layer binding along its body top and headstock, plus a bound fingerboard. There are some cool personal touches, including a Judas Priest “Trident” logo on the headstock and a “Falcon” logo on the 12th fret, plus a custom three-layer pickguard that nearly shrouds its entire mahogany body. With its comfortable weight, the Faulkner Flying V feels perfectly balanced to achieve maximum density for hard rock and metal tones. The active EMG pickups (EMG-57 bridge and EMG-66 neck) are a smart choice, providing clarity and definition with high-gain distortion, while never sounding muddy. Clean tones sound equally cutting and crystal-clear when you play this guitar at loud volumes. The Floyd Rose 1000 Series Tremolo with an R2 locking nut keeps the guitar locked in tune for dive-bombing flights and aggressive whammy techniques. There’s no mistaking the fact that Faulkner’s V is meant to be played standing up with fans below your feet. Wanna get your Eighties-style shred on? Look no further than Jackson’s X Series Soloist SL4X, gloss-finished in an unapologetic bubblegum pink. But this guitar is more than just a big-hair throwback. While the Soloist shape has been around for decades, the SL4X elevates its aerodynamic look in cleaner lines and sleek contours, with white neck binding and a single-ply white pickguard, making it look like the most polished of superstrats. Furthermore, the triple single-coil configuration of the Duncan Designed HR-101 Hot Rails ceramic magnet pickups (with the bridge and middle screwed directly into the body) offer more bite and power than some humbuckers. Combined with a five-way blade pickup selector and a master volume and tone, the tonal character of the SL4X is unlike anything in Jackson’s stable of shred guitars. Plugged in, the SL4X is about the most fun you can have with a guitar that’s clearly designed for enduring high-speed performance. The flatter compound fingerboard radius, low action and slim neck profile make playing the guitar effortless across the whole neck span with nary a fret out or buzzing. The Floyd Rose tremolo keeps the guitar locked in tune and enhances harmonics when you dig into notes. Most of all, there’s a wealth of tones that can be achieved with the dual blade Hot Rails, which have a warm, open sound on clean settings but become far more aggressive with scooped mids when introduced with high gain. Just grab a can of Aqua Net and start shredding. Although a few dozen companies collectively produce the several hundred different seven-string solidbody electric guitar models that fill the market today, Ibanez has had a head start on all of them, thanks to being the first manufacturer to mass produce this type of instrument roughly 30 years ago. With its single master volume control knob, pair of DiMarzio Fusion Edge ceramic magnet passive humbucking pickups and three-way pickup selector switch, the RGD3127 may seem stripped-down and minimalist, but make no mistake—this is an upscale instrument built with exacting attention to detail, particularly when it comes to performance, playability and sound. In particular, the DiMarzio Fusion Edge pickups are a revelation, delivering crisp, clean tones and outstanding note-to-note detail when pushed with high-gain distortion. The midrange is deliciously full-bodied, the bass offers ample twang and thump and the treble is bell-like and shimmering. Overall the tone is big and ballsy, but with a hi-fi-like sheen and resonant, acoustic-like projection. Watch out for the extra-pointy headstock! When he’s not building six-strings, Ola Englund plays guitar in The Haunted and Feared—so it’s safe to say he knows his way around an extreme metal axe. And the Solar A2.6 is without doubt an extreme metal instrument. With its sharp cutaways, ergonomic contours and a headstock that you could spear fish with, no one would mistake this for a pop or country music machine. The A2.6 boasts a solid swamp ash body with a maple neck and ebony fretboard, and everything on the instrument is slick and built for speed, from the neck-through construction to the extremely rounded heel to a neck profile that's as slim as they come. A pair of Duncan Solar humbuckers sit in the neck and bridge positions, with a five-way blade selector to switch between them. Positions two and four split the pickups’ signals for a wide array of tones, and, perhaps surprisingly given its looks, the A2.6 performs just as well as a clean machine as it does an overdriven metal monster. If you’re in the market for a metal guitar, it’s safe to say that Wylde Audio will have you covered. Wylde's company offers an array of axes with which to bludgeon audiences, but the Odin stands out for its classy looks—a variation on Wylde's at-one-time ubiquitous Les Pauls—and excellent playability. First and foremost, there’s the fat, three-piece maple neck, which imbues the Odin with top-notch stability and tone. The active EMG 81 pickup in the bridge position is a classic move, offering powerful output and sustain and razor-sharp response. Ditto the EMG 85 in the neck, which brings with it plenty of thick, rounded sounds. And the Odin’s looks—the unique finishes, old-school headstock and Wylde’s trademark oversized block fretboard inlays—can’t be beat. A guitar that is unapologetically bold and brash, just like Wylde himself. With its gloss black finish and white binding surrounding the entire top, fingerboard and headstock, the mid-line MK5 Warlock has a classy, elegant appearance that contrasts the radical curves and points of its body shape. German carving around the body’s top edges and a rosewood fretboard completely free of inlays further enhance the MK5 Warlock’s sophisticated appeal. Although the MK5 Warlock has a set-in mahogany neck, the heel is smoothly and seamlessly contoured to the mahogany body to provide the same “heel-less” feel of B.C. Rich’s beloved neck-through-body designs. The neck is also finished in gloss black and has a 24 3/4–inch scale, 24 medium jumbo frets, a 13 3/4–inch radius and a slim, shallow C-shaped profile. What really seals the deal is the MK5 Warlock’s crisp, refined tone. The pickups deliver output that’s not too hot or weak (there’s that “just right” balance again), providing aggressive attack and upper midrange snarl along with tight, refined bass that keeps even the most distortion-saturated tones sounding clear and well-defined. With clean amp settings the treble sparkles and shines without sounding thin or shrill. While its looks may say “metal,” the MK5 Warlock is really ideal for any style of music where a dual-humbucker guitar is welcome. The JS32T looks sharp and plays sharp, offering all that Randy Rhoads goodness at a very low price. The tune-o-matic-style bridge allows for extremely low action, and, combined with the satin-finish neck, will have your fingers flying high (again) up and down the fretboard. Add Jackson’s high-output humbuckers to the equation and the Rhoads serves up enough snap and sizzle to fuel any metal anthem. Other features include a basswood body, maple neck and rosewood fingerboard, one volume and one tone knob and a three-way selector switch. A particularly nice touch is the string-through-body design. Then, of course, there’s the killer white-and-black finish and classic, trademark shape—just don’t try to sit down while playing it. Don’t let the soft, rounded curves and T-style body and headstock fool you: the Joe Duplantier Signature packs the sonic wallop Gojira fans crave. A more affordable version of Duplantier’s custom shop guitar, the Pro-Mod San Dimas boasts a nato (so-called Eastern mahogany) neck and body in place of mahogany, as well as a set of super-hot Duncan Designed HB-103s in place of the more expensive model’s custom-wound humbuckers. Whether you’re looking to pull out some dark and doomy chord work, shredding leads or Gojira-type harmonic squeals, this Pro-Mod has you covered. It might look minimalist, with black hardware against a stark satin white finish—there aren't even any fret makers on the fingerboard—but the Joe Duplantier Signature Pro-Mod San Dimas Style 2 HH provides maximalist metal tone. Schecter has been in the 8-string market for a few years now, but the Omen-8, boasting a contoured basswood body, maple neck and 24-fret rosewood fretboard with jumbo frets, is the company’s most affordable model. The Omen-8 comes with a .010 string on the top, going down to .069, and it's intended to be tuned (low to high): F#, B, E, A, D, G, B, E. The neck is a bit longer—scale length is 26 ½ —but the extra size is not very noticeable, nor is the neck too thick. The fingerboard is fairly wide, as to be expected, but is not beyond navigation. Played acoustically, the Omen-8 exhibits a strong, defined tone with plenty of sustain. With the distortion cranked, the naturally chunky tone comes through. Given the price, there are some noticeable issues—passive humbuckers are susceptible to noise and interference and the heel joint is a bit clunky—but overall the Omen-8 exhibits great playability and a solid build. And for eight strings, the price can’t be beat. With its glued set-in mahogany neck and mahogany body with V-shaped string-through-body tailpiece, the Brent Hinds Flying V Custom is inspired by the timeless 1958 Flying V design. Like the first V, it also has two humbucking pickups, a pickguard covering only the lower half of the body, a master tone and individual volume controls and a 22-fret neck with a 24 3/4–inch scale. Even the neck’s slim, rounded profile is based on that of a 1958 V. However, it also shares several features similar to a Les Paul Custom, including the ebony fingerboard with block inlays, multi-layer body and headstock binding, bound fingerboard, top hat knobs with metal inserts and “split-diamond” headstock inlay. The most significant customized touch is the pair of Lace USA Brent Hinds Signature Hammer Claws humbuckers that deliver soulful midrange and solid bass thump that sounds equally awesome clean or distorted to oblivion. In general, the guitar is loaded with so many cool features that there’s not just one reason to consider adding it to your arsenal. But if you’re still sitting on the fence you should also know that it has Hinds’ skull graphic logo in neon green on the back of the headstock. Game over.